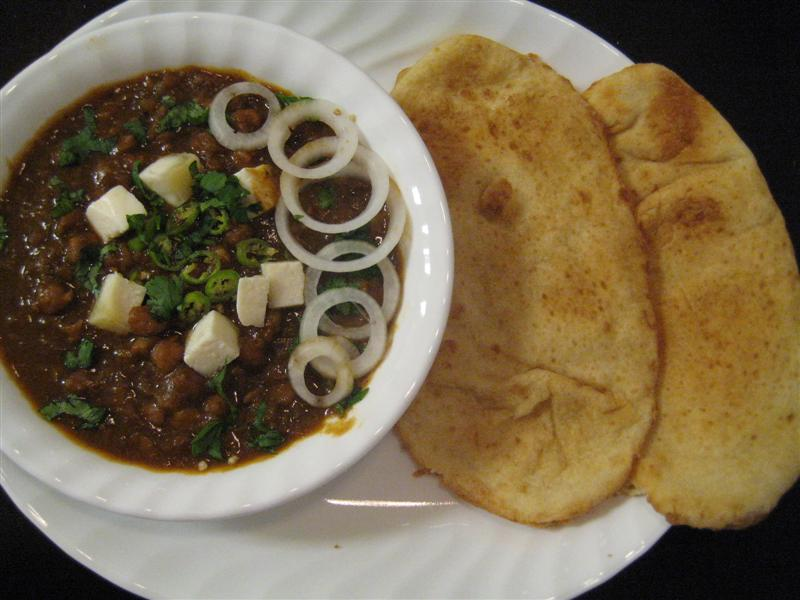 Boil Chole/Chana along with tea bags in pressure cooker/Microwave till they become soft. On Medium Low Heat, Heat the Pan first and put Oil in Pan. When oil is ready (you can throw one cumin seed if it sizzles then oil is ready). Add Cumin seeds. When Cumin Seeds splutter, add minced Garlic and Ginger Paste. Add coriander powder and fry for some time till it becomes light brown. Add turmeric powder & chili powder and Salt to taste. Add Garam Masala and Chana Masala and again fry for some time. Add Pureed tomatoes and fry till the oil leaves from the sides. Take out the Tea Bags and Add Chole/Chana into the Pan without water and stir so that it gets mixed up well. Add the same water which was left in pressure cooker while boiling Chole/Chana . Cook the Chole/Chana with gravy for 8-12 min’s till gravy dries (but Chana or Masala should not burn). Garnish with Coriander Leaves and ring Onions and Tomato. Serve with Puris, Parathas, Chapatis or Rice. I used a mixture of kabuli channa and lobia (blacy eyed beans), both soaked overnight and then boiled with a chopped onion and grated ginger for 3 whistles. Rest of the ingredients and method the same. Results were good. Thanks. hi. use of tomato is in directions no. 10 and 15. I loved your recipe. It looks so yummy will try it. Hi there, your recipe looks great. can you tell me which chana masala powder do you use? thanks for sharing great recipes. hi chitra, thanks for sharing such a wonderful recipe. i tried it and its so yummy. Its great n yummy i also add ground roasted jeera with anaardana , really mouthwatering dish. I am big food lover and let me tell you............this dish is soooooo good with bhature........you can get that (frozen) at any indian store.........you will LOVE it! Hi friends, These Punjabi Chane are really great. I tried today and everyone like them a lot. U can try with Tea bag or without tea bag both comes out great. The best part is they are so easy to make.